Climb the walls, dodge obstacles, and boost into ridiculous speeds down the longest wooden tunnel in the world. Pipe Race gives you a chance to simulate a hyper-fast super pipe cleaner . 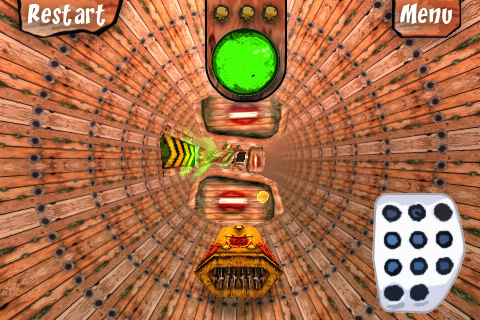 Developed by Alkacom, Pipe Race is available on the iPhone, iPod touch, and iPad for $0.99. I can’t believe this is the first time I started with a comment like this, but the soundtrack to this game is rockin’ awesome. It really reminds me of old fighter games and has tons of energy. The most memorable part of this app for me is the music and I actually liked it a whole lot. Now then, let’s talk about the gameplay. You control a pod rocket thing by tilting your phone to steer, and you have a giant brake button on the side. You press that to slow down enough to steer around the random obstacles in the path. You have to dodge the spikes, wall panel things, and try to land on speed-up ramps to get even faster. When you collide with an object, you come to a full and complete stop. This can be rather frustrating since the extreme sudden stop for minor errors and then the really annoying slow start up can ruin whatever momentum you were feeling during the really entertaining fast parts. Now I know you saw the screenshot. I know I have to comment on this because somehow, developer Alkacom didn’t. This game’s textures look bad. Wood textures tiled infinitely with dark circles all over? Really? It couldn’t be large metal parts? It couldn’t be some futuristic glass tube? It couldn’t be like a virtual reality thing like in Tempest or Torus Trooper? Nope. Wood planks. At least a metal pipe theme could have logical obstacles like pipes or fans. The wood looks bad. Almost nauseatingly bad. I thoroughly enjoyed the music, the gameplay, when at full speed, is great fun, but man the graphics need a complete retexturing. Please. I can’t play this for more than 2 or 3 minutes at a time because of the headache I get from the repeating wood plank textures. Even the user interface is pretty bad thanks to the photoshopped wood textures. It looks really cheap and the whole Pipe Racer concept just doesn’t make me think about wood. A reskin along with maybe some more dramatic way to deal with collisions could improve this game into an exciting, fast, bombastic speed game with a coherent theme. 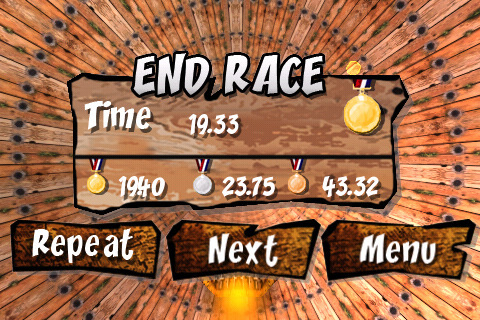 AppSafari review of Pipe Race was written by Joseph Ho on November 8th, 2010 and categorized under App Store, Games, Racing. Page viewed 3332 times, 2 so far today. Need help on using these apps? Please read the Help Page.